Travel Boulder values your privacy and wants to assure you that we are doing everything we can to protect your personal information. In every email you receive from Travel Boulder there will be a link at the bottom of the email allowing you to unsubscribe from all future emails. When you sign up or subscribe to receive e-mails from Travel Boulder, we may place a one-pixel gif to determine whether or not readers viewed the e-mail. This process will not leave any information on your computer, nor does it collect information from your computer. Travel Boulder may share this data with others in aggregate for research purposes. 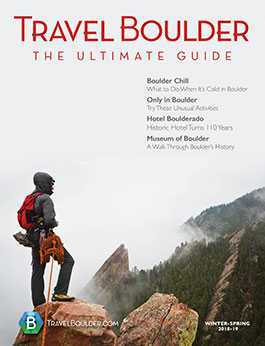 If you are not a current subscriber, but would prefer that Travel Boulder never e-mail you about Boulder simply notify us by e-mail, @ [email protected] or telephone us at 800-807-1013. This website uses Google Analytics to help analyze how users use the site. The tool uses “cookies,” which are text files placed on your computer, to collect standard Internet log information and visitor behavior information in an anonymous form. The information generated by the cookie about your use of the website (including IP address) is transmitted to Google. This information is then used to evaluate visitors’ use of the website and to compile statistical reports on website activity for Travel Boulder. This website contains links to other websites not owned by Travel Boulder. Please be aware that we are not responsible for the privacy practices of those, or any other, sites. If you have questions about how those websites collect and use data, you should carefully read those sites’ privacy policies. All of the information on this Web site(s) is provided by Travel Boulder. Travel Boulder provides this service to you, subject to the following Terms of Service (“TOS”), which may be updated by us anytime without notice to you. When using particular Travel Boulder services, you shall be subject to any posted guidelines or rules applicable to such services that may be posted from time to time. All such guidelines or rules are hereby incorporated by reference into the TOS. For specific services, Travel Boulder also may put forth specific Terms of Service that differ from this TOS. It is your responsibility to periodically review the TOS. If you do not agree with or understand the TOS, do not use Travel Boulder site. Travel Boulder’s Website (travelboulder.com) contains business listings, comments, interactive ratings and reviews where you or other third parties may post business listings, comments or traveler reviews and photos. You understand that all information, data, text, photographs, graphics, messages, or other materials (“Content”) are the sole responsibility of the person from which such Content originated. This means that you, and not Travel Boulder, are entirely responsible for all Content that you upload, post, e-mail, or otherwise transmit via the Site. Travel Boulder does not control the Content posted via the Site reviews and thus does not guarantee its accuracy, integrity, or quality. By using the Site you may be exposed to Content that is offensive, indecent, or objectionable. Under no circumstances will Company be liable in any way for any Content, including, but not limited to, for any errors or omissions in any Content, or for any loss or damage of any kind incurred as a result of the use of any Content posted, e-mailed, or otherwise transmitted via the Site. “stalk” or otherwise harass another or collect or store personal data about other Users. With respect to all Content you elect to post to the Site, you grant Travel Boulder the royalty-free, perpetual, irrevocable, non-exclusive, and fully sub-licensable right and license to use, reproduce, modify, adapt, publish, translate, create derivative works from, distribute, perform, and display such Content (in whole or part) and/or to incorporate it in other works in any form, media, or technology now known or later developed. You agree not to reproduce, duplicate, copy, sell, resell, or exploit for any commercial purposes any portion of the Site, use of the Site, or access to the Site, except in accordance with the TOS. You agree that Travel Boulder, in its sole discretion, may terminate your password, account (or any part thereof), or use of the Site and remove and discard any Content within the Site for any reason. Travel Boulder may also, in its sole discretion and at any time, discontinue providing the Site, or any part thereof with or without notice. You agree that any termination of your access to the Site under any provision of this TOS may be affected without prior notice, and acknowledge and agree that Travel Boulder may immediately deactivate or delete your account and all related information and files in your account and/or bar any further access to such files or the Site. Further, you agree that Travel Boulder shall not be liable to you or any third party for any termination of your access to the Site. This site provides links to many web sites that are not controlled, maintained, or regulated by us. Travel Boulder is not responsible for the content of those linked web sites, nor does it assume responsibility for the use of the sites. You agree to indemnify and hold Travel Boulder and its subsidiaries, Affiliates, officers, agents, co-branders or other partners, and employees harmless from any claim or demand, including reasonable attorneys’ fees, made by any third party due to or arising out of Content you submit, post to, or transmit through the Site, your use of the Site, your connection to the Service, your violation of the TOS, or your violation of any rights of another. Travel Boulder makes no express or implied warranties, representations or endorsements whatsoever with respect to the site, the service or the content. Travel Boulder expressly disclaims all warranties of any kind, express, implied, statutory or otherwise, including, but not limited to, implied warranties of merchantability, fitness for a particular purpose, title and non-infringement, with regard to the site, the service, the content, and any product or service furnished or to be furnished via the site. Travel Boulder does not warrant that the functions performed by the site or the service will be uninterrupted, timely, secure or error-free, or that defects in the site or the service will be corrected. Travel Boulder does not warrant the accuracy or completeness of the content, or that any errors in the content will be corrected. The site, the service and the content are provided on an “as is” and “as available” basis. All commercial and advertising uses of the images and text on this Site are strictly forbidden without written consent. To receive permission, please send an email to [email protected] or call 800-807-1013 and ask for the Communications Department.